Chrichton's World: Review Quantum of Solace (2008): Filler Bond! Review Quantum of Solace (2008): Filler Bond! Quantum of Solace is a direct sequel to Casino Royale as it starts where it ended. Bond is in the middle of a car chase and you are immediately confronted with one of the biggest flaws of the film. The way the action is filmed and edited. And that is quite a huge thing in a film series that is revolved about spectacular action and stunts. Especially in the first part of the film the action sequences are filled with quick cuts and shaky cam shots that will make your head spin. I am not a fan of quick cuts but if done right I am not against it. In Quantum of Solace though it ruins the action and therefore the enjoyment. To be fair this would not been such an issue had the plot some substance that would enable me to overlook the flaws. But like many films made in those days they suffered from the writer's strike. Still I find it curious that they need writers in the first place to come up with a plot for this Bond film because all they needed to do was set up a story around the action and tie in with the overarching story just enough. They sort of do that but then again they don't. Bringing back Mathis was genius though since he does bring in that something extra to make Bond and events more compelling. The fact that Bond himself is a little more bloodthirsty while at the same time denying that he is angry about the Vesper tragedy makes it fun. M keeps second guessing her decision to have Bond assigned as agent since he seems out of control. But she completely overlooks the fact that because of his tenacity and determination he has been quite efficient putting MI6 on the trail of this secret organization (that has been causing problems in the first place). Although she does come to the realization that someone might be manipulating her and the agency. There is something menacing about this secret organization pulling the strings. Even if by this point it's obvious who is behind it. 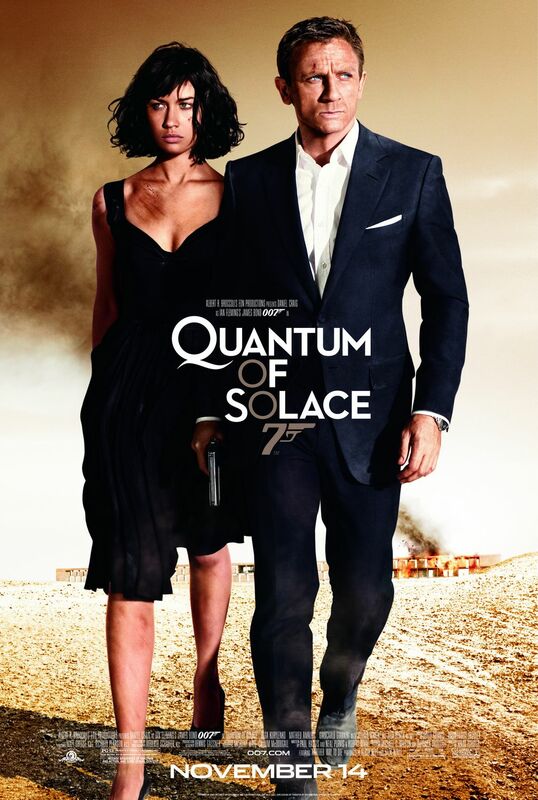 Overall Quantum of Solace feels like filler. Events and actions of Bond hardly matter in the grand scheme of things and you very easily could ignore it and you wouldn't miss a thing. Reboot Bond already suffered from the lack of trademark bond elements but now you get even less of that. There is nothing memorable about this Bond film. Absolutely nothing. So is this a waste of time then? I do think Daniel Craig and Giancarlo Giannini make it worth your time just don't expect to be wowed by the action.